Cherry Bomb auto from Bomb Seeds are autoflowering seeds. These weed plants are originated by crossing the Cherry Bomb x Siberian Ruderalis. This plant contains a mix of Indica and Sativa genetics. Bomb Seeds Cherry Bomb auto are weed seeds that are appropriate for an indoor grow and outdoor grow. These weed plants are easy to grow which makes them suitable for growers with less experience. In a reasonable short time these plants produce nice thick buds with a high content of THC. The effect of smoking this weed is rapid high that you feel in your head, this slowly overflows in a relaxed feeling in your body. 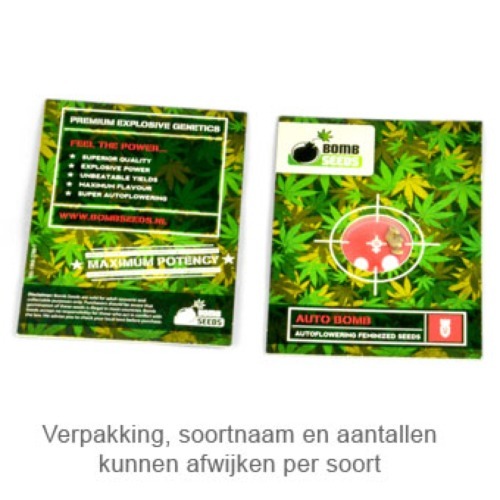 Everyone that wants to grow a good weed can use these autoflowering seeds. Tell us and our customers what you think of the Cherry Bomb Autoflower from Bomb Seeds.